Attorney Douglas M. Feldman | Subrogation Lawyer in Wisconsin | Lindner & Marsack, S.C.
"Worker's Compensation is a very important field of the law … The welfare of human beings, the success of business, and the pocketbooks of consumers are affected daily by it." Douglas M. Feldman is a shareholder and member of the Board of Directors with the law firm of Lindner & Marsack, S.C. He currently focuses his law practice on representing insurance companies and large self-insured employers in the defense of worker's compensation claims and other related work-injury defense claims. Mr. Feldman assists clients with worker's compensation matters and represents management in different types of employment and labor relations matters. He frequently counsels employers on best practices in dealing with light duty, return to work and other related labor and employment law issues in the workplace. He also handles wrongful termination matters and defends employers in unreasonable refusal to hire claims under the Worker's Compensation Act, as well as claims alleging disability discrimination and failure to accommodate under the Americans with Disability Act (ADA) and the Wisconsin Fair Employment Act (WFEA). As a worker's compensation specialist, Mr. Feldman is a frequent speaker on a variety of worker's compensation and related employment topics both in Wisconsin and nationally. 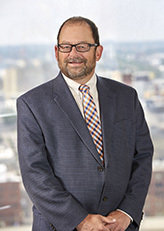 He has been elected a fellow in the College of Worker's Compensation Lawyers; he has been named in Best Lawyers in America for worker's compensation for 2010, 2011 and 2012; and he has been named a Wisconsin Super Lawyer since 2008.